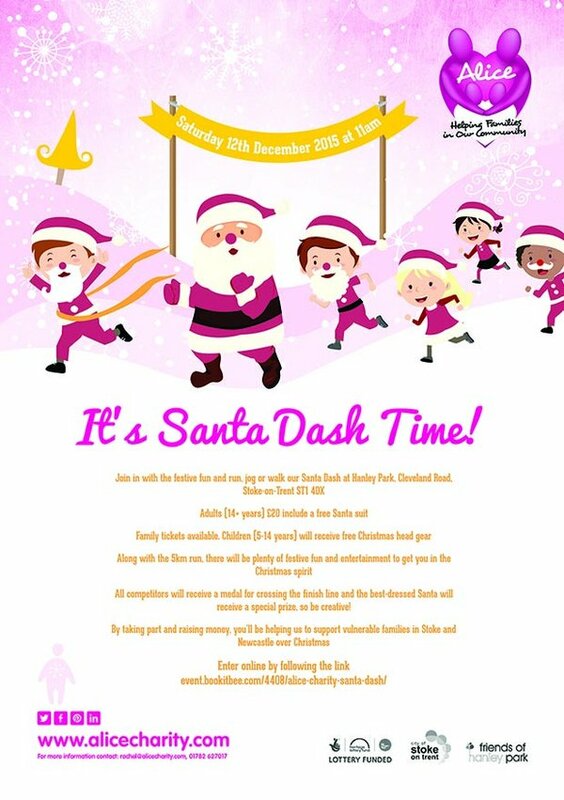 Runners, joggers, strollers and walkers are being sought for Stoke-on-Trent’s charity Santa Dash. The Alice Charity Is appealing for people to join the festive fun run at Hanley Park on Saturday, 12 December. Santa dashers aged 14 or over will be supplied with a free Santa suit in return for a £20 donation to the North Staffordshire based charity which specialises in helping families in need. There will also be family tickets available, with children being given free Christmas headgear to wear. “We’re hoping to turn the 5km fun run curse into a riot of festive red with dozens of Santas on the run and Christmas themed fun for all the family,” said Alice Charity Chief Executive, Steph Talbot. “By taking part, people will be helping to support vulnerable charities throughout Stoke-on-Trent and Newcastle-under-Lyme. 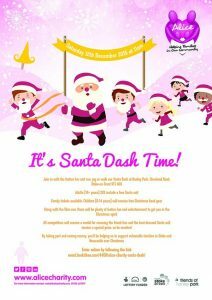 The Santa Dash is being held by Alice Charity in association with Stoke-on-Trent City Council, Friends of Hanley Park, All Saints Church, Joiners Square, and the Rev. Geoffrey Eze. The Alice Charity was founded in 2011 to provide social, emotional and financial support for families in need of a helping hand. Alice’s vision is to help 5,000 families by 2017.